Branch Technology has erected what it claims is the world’s largest 3D-printed structure for Nashville, Tenn.’s OneC1TY neighborhood. Unveiled at the 2018 International Association for Shell and Spatial Structures this week, the structure strands at 20 feet tall and stretches 42 feet wide. Chattanooga, Tenn.-based firm is known for its unique 3D printing process, Cellular Fabrication (C-Fab), which sees industrial robotic arms extrude a composite made of carbon fiber-reinforced ABS plastic. 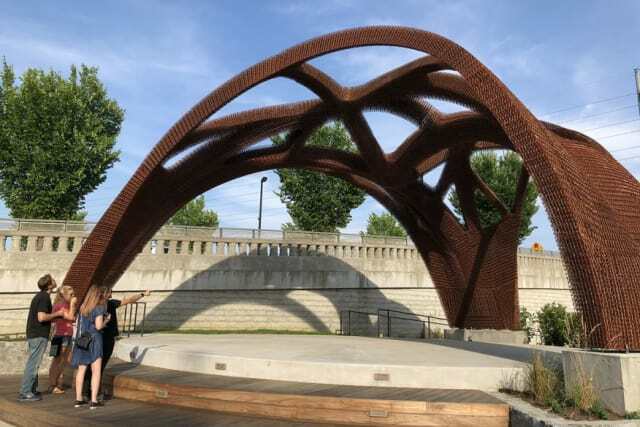 While this process was initially designed for creating the inner scaffolding of walls made from spray foam and concrete, the startup has been 3D printing large pavilions to demonstrate just how capable the technology is. This latest example was commissioned by a Dallas-based developer, Cambridge, and designed and produced by Branch Technology. While the original design suggested the need for a steel support system, the design was optimized to remove such a requirement, and the price tag that would go with it. To accomplish this, Branch Technology worked with R&D incubator CORE Studio to create an open-cell design. This was 3D printed with the C-Fab system in 40 different panels over the course of 10 weeks before being coated in a UV-protective paint. The panels were then shipped and assembled on-site, creating a pavilion that weighs about 3,200 pounds. The structure can withstand an inch of ice buildup, 12 inches of snow and 90 mph of wind load. Whether or not it really meets the standards of the largest 3D-printed structure is difficult to determine without a Guinness World Records representative standing by. The only competition might come from the large-scale structures created by Chinese additive construction firm WinSun, which has 3D printed an apartment complex and villa, among other things. To learn more about these various additive construction techniques, read our article on the topic.